Riviera Art Tour Includes: Private transportation, English speaking tour guide, taxes, tolls and parking. This privately guided tour featuring the fine art of the French Riviera begins with a sightseeing drive along the coast to Villefranche Bay and Saint Jean Cap Ferrat, known as the Beverly Hills of France. You will visit the decadent Villa Ephrussi de Rothschild, featuring the prized art collection amassed by the Baroness Ephrussi. You will enjoy its nine magnificent gardens, adorned with patios, fountains, ponds, and flowered and shaded paths, and the panoramic seaside views from here. 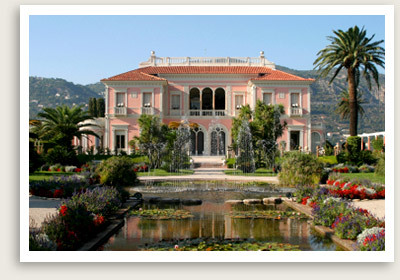 Next your private tour will drive to Nice, stopping at Cimiez Hill, which was the winter home of Queen Victoria. You will visit the nearby Matisse Museum (45-minute visit), located in a 17th century Italian house. Here you will view Matisse’s personal collection. Matisse lived in Nice for nearly 40 years; the paintings, drawings and engravings housed here represent the breadth of his work. You will also have a 45-minute visit to the Chagall Museum, which was opened by the artist himself in 1973. The permanent and temporary exhibitions here are wide-ranging, including sculptures, stained glass windows, mosaics, tapestries, sketches, engravings, and lithographs.